A curriculum vitae is a document used to list one's qualifications and apply for employment. It works in much the same way as a resume and provides detailed information about an individual's educational and work history. Often called a CV for short, it is much more comprehensive than the typical resume and therefore can be much longer. There is no limit to how long, but a CV must include only information that is needed to illustrate your academic and professional experience. A lengthy CV isn't any better than a short one if it contains fluff or irrelevant data. A job applicant seeking an academic job, like a teaching appointment at a college or university or a research position, for example, should always use a CV. They are also used when applying for jobs outside the U.S., but in that context, the CV is more similar to a standard resume. If you are unsure about which application document to send to a prospective employer, use the job announcement to guide you. It will usually state which document the institution wants. Like a resume, your CV must begin with your contact information, such as your complete name, address, telephone number and email address. You must also indicate your area or areas of academic interest. While a resume's focus is on your experience and has an overview of your educational background, for example, schools attended and degrees earned, your CV should include a comprehensive account of your academic history, including the title of your dissertation or thesis. It must contain details about all publications, research projects and presentations to which you have contributed. You should also list any grants, academic awards and other related honors you've received. The employment and experience section of your CV should contain your teaching and research positions, both paid and unpaid. In addition to jobs, include any relevant internships and volunteer experiences here. Following that section, discuss your memberships in scholarly and professional associations and include offices you have held, if any. Finally, you will also need to provide a list of references, along with their contact information, on your curriculum vitae. These are the people who have written letters of recommendation about you. Doing this is also in contrast to a resume, which never contains this information. Avoid the temptation to get creative. Your resume should use a simple font, like Helvetica. Times New Roman is okay, but many people consider it "boring." Use white or another neutral colored paper with black ink for the hard copies of your resume. Check the format. Consult the job announcement to see what format an employer wants your CV to be in. If it isn't indicated there, use a standard one, like .docx. Only include factual information. Lying on your CV will only result in negative consequences. Given how small most areas of academic interest are, any attempts at using inaccurate information will likely follow you throughout your career. Don't get too personal. Stay away from personal information like hobbies and physical attributes. Keep it professional. Make sure you use an email address that sounds professional. A silly, vulgar or suggestive one could get your CV tossed. Edit, then edit again. Check and then double-check for any typos, misspellings, grammatical errors and other mistakes. Have someone who has an excellent command of the language, and an eagle eye, proofread your CV for you. 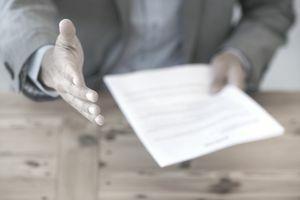 A mistake-laden document will make you look sloppy and careless, and that certainly isn't the message you want to convey to a potential employer. A few typos may be all it takes to get your CV tossed into the circular file. Overall, keep your CV targeted, and use concise language to get your experience across to the reader. Your CV should tell your prospective employer the story of your past work experience, and why you're the one who can best fill their needs for the job.